Indian pacer Jasprit Bumrah has been one of the most inspiring tales of the Australian summer, where he scalped 21 wickets in the four-match Test series. Indian pacer Jasprit Bumrah has been one of the most inspiring tales of the Australian summer, where he scalped 21 wickets in the four-match Test series. The bowler with an uncanny action picked wickets consistently and none of the Australian batsmen looked at ease with him. Bumrah surely played a huge role in the historic win for India and his fast bowling in the win will be remembered for a long time. 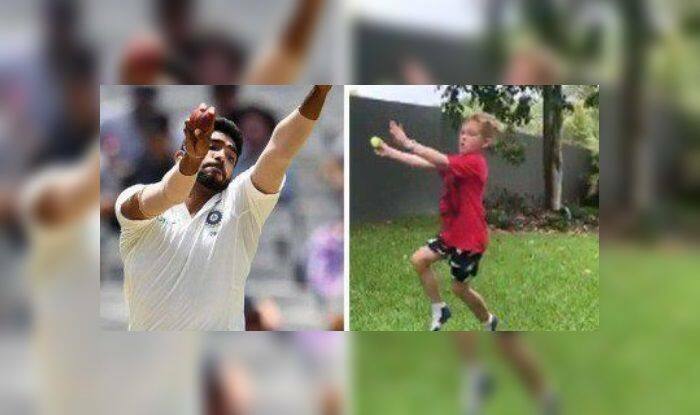 It seems like he has not only been inspiring Indian, but he has a new Aussie fan who was seen imitating Bumrah. Bumrah responded by writing, “The kid is so cute . Give him my best wishes.” Veteran commentator Harsha Bhogle, who was also tagged in the post, replied by terming the kid’s efforts as “excellent”. Meanwhile, Bumrah has been rested for the upcoming ODI series in Australia and New Zealand to give his shoulders rest and keep him ready for bigger games in the future, a decision which has attracted mixed opinions. During the Melbourne Test, he also bagged a career-best six for 33 to decimate the hosts at a time when the series was locked at 1-1.